I’m a big fan of just putting stuff out there and trusting the journey, so here goes. I’m donating one free semi-private class for women new or returning to bikes each month throughout May 2018 (after which point, big changes are happening in my life). My fingers are crossed that bikeshare will come to the park closest to my home (one city councilor just said on Twitter that it’s a great idea and she’ll ask Staff to pursue it), but that may take awhile. In the meantime, there’s a park named Rock Mill (pictured) in the nearby city of Alpharetta, Georgia that already has Zagster bikeshare. It already has access to a multiuse path called the Big Creek Greenway where I ride frequently (that’s where I went when I took my bike, pictured, out of the attic after 20 years — that story kicks off Chapter 2 in my book). It already has little brochures saying all the good things about bike riding and including detailed maps (from a bike advocacy group headed by the man who was my presentation partner during our League Cycling Instructor training). The city already has a plan for an access-for-all loop that connects the greenway with the city’s downtown and its other commercial districts that a bike rider will be able to use to actually go places. And my mother lives there, so I have yet another reason to be there. So I’m open to that one. I’d also like to work with corporations and nonprofit organizations (especially those that previously employed me or were clients of mine) that have safe access to a City of Atlanta Relay bikeshare station and a multiuse path or park (such as Coca Cola, the American Cancer Society, CNN, Mailchimp, How Things Work, and others). 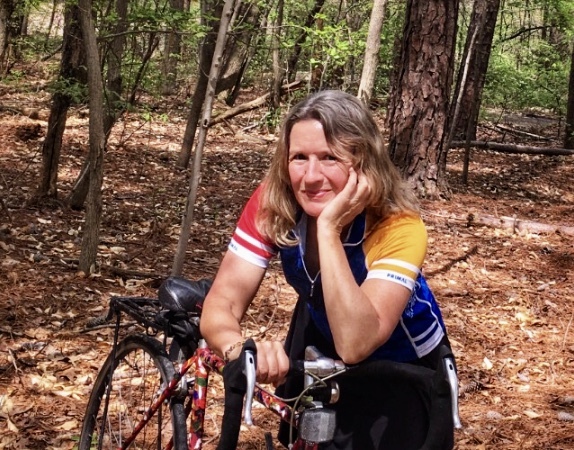 And I love teaching women who already have their own bikes but need some coaching to get going, like Ella, as well as volunteering with organizations such as the Atlanta Bicycle Coalition. Plus, of course, I’ve already taught classes for a year with the City of Decatur (seniors-on-trikes, earn-a-bike, and more) and am happy to help them out again (this time for free) with a special semi-private class specifically for teenage girls or women. January and February have both been booked already, and I am currently locking in March. March 4, in fact. March fourth. That’s my favorite day of the year for recommitting to goals, including Traveling at the Speed of Bike to improve mental and physical health, the environment, the local economy*, and community connections. If you are in a position to arrange a class like this for your citizens or employees, let’s talk. *Bike riders shop locally, and more often, than those not on bikes. Plus, women make or influence 80% of all consumer purchase decisions. Women-on-bikes who have safe access to places they actually want and need to go, and secure bike parking once they get there = increased business. UPDATE! Jan. 22: All dates are now booked. Previous Post Bikeshare coming to Brook Run Park?